The accumulation of world-leading expertise in ‘omics’ research, geo- and biochemistry, as well as marine biological instrumentation across EPS, BS, ES and CBMS at MQ is unreplicated in Australia and rarely encountered worldwide. Infrastructure is further enhanced with the off-campus possibilities offered by SIMS, access to the new Australian Marine National Facility Research Vessel RV Investigator and participation in the International Ocean Drilling Program (IODP). Each of the participating departments contributes top-level laboratories, technological equipment and expertise. EPS hosts the ARC Centre of Excellence for Core to Crust Fluid Systems (CCFS), with infrastructure in the Geochemical Analysis Unit allowing high resolution imaging and in-situ chemical characterisation, essential for extracting detailed climate change palaeorecords. EPS also hosts fully equipped organic and biogeochemical laboratories for biomarker analyses and in-situ sample characterisation, as well as a new sclerochronology lab. X-ray diffractometry, quantitative sedimentology equipment and luminescence dating laboratories are accessible through ES. Facilities at BS include a new aquatic facility with manipulations of pCO2, temperature and salinity, three research vessels, scientific diving equipment, coastal and marine sampling instruments (CTD, DO, pH, DGPS, GPR, total station and coring), wet, dry, high-security PC2 and quarantine laboratories, a Microscopy Unit (light, stereo, confocal, SEM/TEM), and an acid leaching facility (chemical processing, fossil/geological material preparation). CBMS provides expertise in marine biochemistry, genetics, bioinformatics, and hosts a newly established synthetic biology hub led by Laureate Professor Paulsen. State-of-the-art molecular technology geared for ‘omics’ research of living systems (mass spectrometry, nano-litre liquid handling, flow cytometry) is accessible. CBMS hosts a node of the ARC Centre of Excellence in nano-photonics developing the technology basis for next-generation ocean sensors. Present day baselines for the metabolic capacity of microbial communities at seven IMOS National Reference Stations are currently being established by department staff. Qualified academic and technical staff are always available to facilitate use of all departmental equipment. The combination of new technology and expertise within the MQ Marine Research Centre provide a productive environment for synergies via the application of novel approaches to reconstruct the geological and biological past. In addition to on-campus facilities, many Centre members are actively involved in IODP activities, thus enabling international collaboration and expeditions using the drilling vessels JOIDES Resolution and Chikyu. Staff across all Centre departments contribute and organise research aboard the RV Investigator, whilst MQ and SIMS are to be the host institutions for the future student training pilot programme CAPSTAN. SIMS is a collaborative research institute bringing together scientists from the universities in the Sydney region, several government departments, The Australian Museum and the Australian Defence Science & Technology Organisation. SIMS is located at beautiful Chowder Bay, Mosman in Sydney, near the Sydney Heads, which provides not only an amazing scenic lookout but gives access to high quality seawater to service the state of the art facilities such as the SIMS research aquarium. As a founding university member of SIMS, MQ has access to its cellular, molecular, microbiological, field biology and geological laboratories, aquaria, seminar rooms, research vessels and oceanographic sampling equipment. MQ is involved in several exciting research projects based at SIMS, such as invertebrate immunology, developing biomarkers to assess estuarine pollution, octopus behaviour, wobbegong tag and release, urchin aquaculture and marine mammals. All facilities have recently been refurbished with high-standard technology. This makes SIMS not only an excellent location for state-of-the-art research, but also one for interactive and productive meetings and workshops. Catering and accommodation with some of the best views of Sydney Harbour is available for use by visiting scientists. Alternate accommodation within the city center and travel to and from SIMS via water taxi or university boat is also possible. 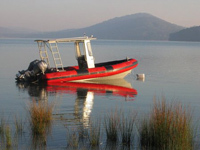 The Faculty of Science at Macquarie University has a number of research vessels available to staff and students, to conduct sea-based research. The vessels are also used for undergraduate teaching, allowing students to gain valuable on the water research experience.